If There's No Argument, You're High Risk. If you want the secret of what goes on behind closed doors at successful organisations it's relatively simple - focus is not on sales, it's on brand. More specifically it's about robust argument that justifies the companies every action, upholding and managing its perceived value. There is only perceived value. It's easy to become oblivious to perceptions when you're working within an organisation day to day. You know that your business can add value to customers and you continually strive for that. However if the market doesn't understand that and has built a different picture in their minds, a perception gap exists. Thriving companies know that they must protect their brand values and actively manage their perceived worth if they're going to withstand change, downturns and competition. They may reinvent themselves visually to stay in line with market demands, but they never stray from their true value and subsequent strategy to ensure people are cognisant of it. In any meeting or discussion, if there's no argument about whether an initiative, idea or policy is going to uphold brand value, then you're simply increasing the strength of your competition. The longer you wait to address the issue the harder it is to dig yourself out of a hole. A short term loss is better than long term slow decline which is what kills brands and good companies. Don't let your message lead you to failure. You have to have the backbone to make decisions that may prove immediately unpopular, but will pay dividends in future. In the world of managing reputation and position, sales and profit are the result of steady planning and management and are not an end to themselves. - you need to carve out a position and stand for something of value. If this perception of value exists, sales will follow. This is why brands must be managed and lead at senior management levels. Companies fail when branding, messaging and marketing are seen as superficial functions wholly managed by external agencies, marketing coordinators and middle management. When this happens and commercial and marketing initiative are separated, failure occurs from mixed messages and promises that are not substantiated through operational strategy. Study the outcomes that you provide, they're not always obvious. You need to look beyond product and service lists as they are what you do - they are not an outcome for your client. There's little differentiated quality in stating you have 'quality products'. It's not that no one will believe you, there's simply little to substantiate your value, resulting in lower margins. However if you combine this with how you're going to deliver this, how you're going to behave and the specific outcome the client will experience, you've got the formula for building a commanding position. On a recent assignment to strengthen a stagnating brand we changed a tagline from 'Providing Quality Solutions Since 1983 to; 'Helping You Avoid Catastrophe'. This has also become the mindset for the entire organsation where the team are not seeing themselves just as 'service providers' who tick boxes - they proactively work with customers to identify and manage failures that could result in millions of dollars in lost revenue. Don't feel the need to tread on egg shells, you'll only offend yourself when customers become apathetic. Don't guess what clients think, get out there and ask them. A key question to ask is 'how would you describe what our company does?' Ask prospects and your staff the same question and you'll be able to see where there are gaps. A common weakness can be identified where people describe you by what you do and not 'their' outcome or experience. Administratively: Outline how you want your team to behave, specifically the language they use with clients, how they approach clients, how they resolve problems. You need to guide them with a set of preferred behaviors. Be cautious here though as you need your team to take ownership of this and not to feel as though they're being 'managed'. The best way to lead this is to use real in-house examples of what to do and what not to do. Operationally: There's no point building a team that identifies opportunities, follows up well and reacts accordingly to clients building up a desired perception, when the warehouse is out of stock, you're over capacity or your software was last updated in 1996. Every area of your business contributes to your positioning. Don't let your hard work down with operational functions that contradict your brand. Marketing: As you can see from the above marketing is a support function that communicates the difference and value of your business. It's a key element in your strategy but It's in no way the be all and end all of your game plan. Many companies make the mistake of trying to improve their market position by focusing their efforts on visual branding, new office fit-outs and printed materials. 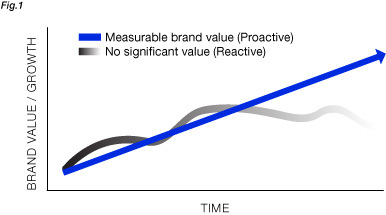 To not substantiate and permeate your brand value throughout your entire organisation is a waste of budget. Be clear on where your sales process fits with your marketing. At what point will your audience receive the message (brochure, website, billboard)? What do they already know about you (current perception) so you can devote their time to moulding their perception on the outcomes and differentiating value of your offering? Old successful brands move from strength to strength. Mercedes Benz no longer needs to brow beat it's audience about its safety record and features, instead it works on ensuring it's position as a comfort and luxury leader. To grow you must recognise the existing perception and move forward from that point. When developing your branding consider who and what you're selling. As much as branding needs to appeal to you, it also needs to appeal to your buyer. It needs to convey outcome and advantage from their perspective. It must also position you in a price point to manage expectations. If you look expensive then you probably are and vice versa. Next time you go into a meeting, simply ask the question - is what's being proposed going to strengthen our position, weaken it or do nothing? If you can't argue and justify what you're doing, you're off course and heading for failure. The byproduct of robust argument is ideas generation. You'll be amazed at how many initiatives you'll develop by arguing relevancy. As long as your strategy is well considered your results will be substantiated through your KPI's. I'm not one for management speak, but the phrase 'if you can't measure it, you can't manage it' resonates here.